There are some places that are so beautiful that they always manage to exceed your expectations. 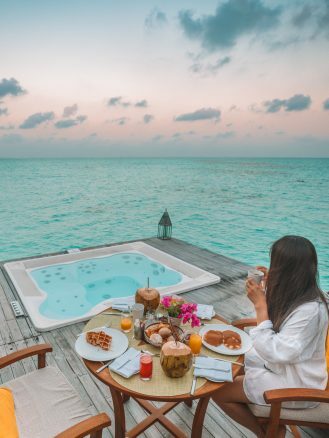 Conrad Maldives Rangali Island is definitely one of them. All the photos and videos I have seen of the resort on Instagram or Pinterest don’t do it justice. 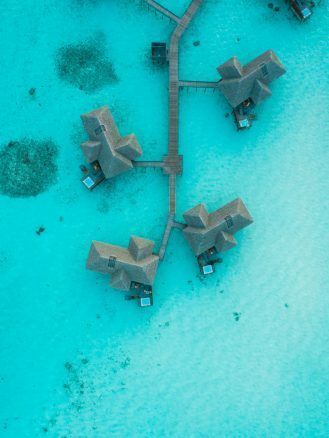 The crystal clear turquoise water, the pristine sandy beach, the beautifully designed bungalows, the delicious Maldivian food, the refreshing cocktails—all of these can only be felt and experienced when you are there. 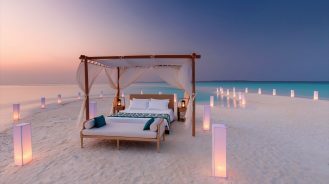 Conrad Maldives is regarded as one of the best resorts in the world by many travel magazines and hotel review sites. It prides itself as “the first” in so many different ways. 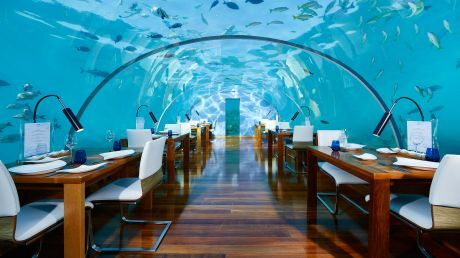 It has the world’s first all-glass undersea restaurant, Ithaa Undersea Restaurant. 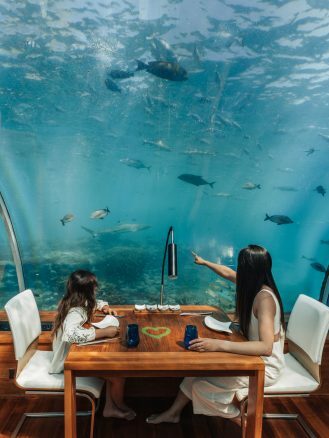 In 2018, it opened the Muraka residence, the first undersea villa in the world. One of the first things we did was to make reservations at the restaurants to secure our spots. Ithaa has limited seating and books out very fast. There are also special nights for romantic dinners on the beach, or Maldive Night, where you get to experience local culture. 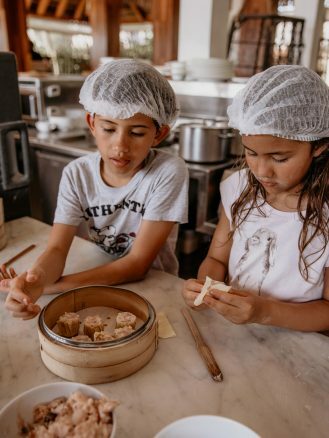 We also tried out the dim sum and noodle-making class at the Mandhoo Restaurant. We and kids had so much fun learning Asian cooking. We can’t wait to go home to show off our newly learned skills to our family and friends. Nothing beats a relaxing spa session at Conrad Maldives. We made an appointment at the beginning of our stay since we knew of the spa’s popularity and high repeat rate. We didn’t want to leave it until last minute to find out that all the available slots were filled. We weren’t disappointed—we felt so relaxed and refreshed after our couple’s massage. Talk about time and money well spent! Another highlight of our trip was the sunset dolphin champagne cruise. 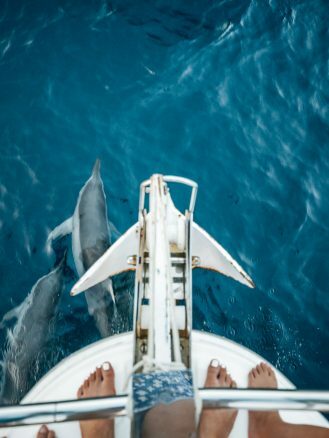 Although never guaranteed (It’s Mother Nature, after all), we knew there was a great chance we’d see a large school of dolphins playing around the boat and accompanying us during golden hour—and we did! The dolphins chased our boat, frolicked at the front and spun around us. It was incredible! Last, but not the least, we loved our diving trip to some of the best diving sites in the region near the resort. You can also snorkel If you prefer. 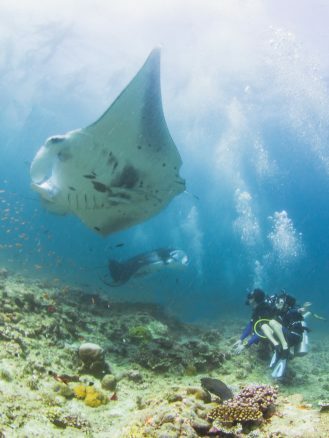 We were so lucky to see thousands of tropical fish, some sea turtles and also manta rays. There are also whale sharks in the region. 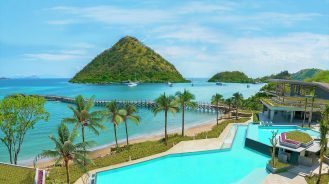 Come to think of it, getting a second chance to glimpse such an elusive creature could be my excuse to return to this incredible resort.